The Lincoln Handicap, traditionally the feature event on the first Saturday of Britain’s turf flat racing season, takes place this weekend at Doncaster, where it has been staged since 1965. The race, which traces its roots to 1849, is a flat handicap race for horses aged four years and older, and is run over one mile. The 22 starters for Saturday’s race include last year’s winner Brae Hill, as well as betting favourites Bertie Hill, Lahaag and the Trial winner Strictly Silver. Rain over the recent period has caused havoc in the days leading up to the event, causing several horses to be pulled out over concerns on their suitability on the soft conditions. Therefore soft-ground performers have been heavily backed antepost. Despite William Hill being the title sponsor for the race, we advise you to place your bets with Bet365.com for this race, which is where the odds listed below were taken from. Bet365.com is also offering each-way betting on the event, whereby you will receive 1/4 if your selection places in positions one to four. Plenty of money has been coming in for the soft-ground performers in Saturday’s field, with Captain Bertie, who was drawn in barrier 21 earlier this week, getting a lot of attention. Since the race was first run at Doncaster in 1965, only seven favourites have gone on to win the race. Captain Bertie faces strong competition from a strong field, which includes 2012 winner, Richard Fahey-trained Brae Hill. Brae Hill will seek to become only the third horse to record successive victories in the race’s history, after Ob (1906-7) and Babur (1957-8). Fahey himself didn’t sound too confident, stating that, although confident that Brae Hill would run his race, he didn’t know whether he was good enough to win the Lincoln again, adding that it would be a great achievement were he to succeed in doing so. Lahaag has been marked as a favourite for the race. The four year old gelding, who has a record of two wins and two second places in his five starts, last ran out in October last year, where he finished second in his only start on a soft going behind Chapter Seven, who is himself 10/1 for Saturday’s race. That race in York was run over one mile and one furlong, and trainer John Godsen will hope that the shorter distance will suit him better. William Haggas is seeking his fourth winner in the race, and will be represented by Arsaadi, who replaced Nine Realms, a leading antepost favourite, as Haggas was worried about the turf conditions. Another trainer who was worried about the conditions was Marco Botti, who warned that it would have to dry up for his Solar Deity to have a chance. 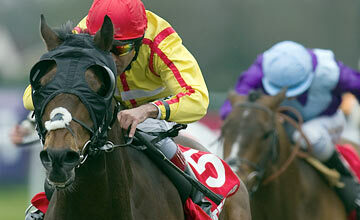 Solar Deity has won four of his five all-weather starts, including the Listed Lady Wulfruna Stakes earlier this month. Silver Strictly came through strongly to win the Trial race at Wolverhampton earlier in the month, and trainer Alan Bailey believes that his horse will be difficult to beat in Saturday’s race, as long as the conditions go in his favour. The recent rain has also worried Belgian Bill trainer George Barker. Belgian Bill ended last season in great form and has had a couple of runs in Dubai since then. The race takes place at 16:50 CET. 11:50 EST. The going for Saturday’s race will be Soft. As we mentioned above, the best place to have a bet on the 2013 William Lincoln is as Bet365.com. When visiting Bet365.com, click ‘Horse Racing’ in the left sidebar and scroll down to the Antepost section of the page, where you will find all the markets for this race. The William Hill Lincoln is the traditional curtain raiser to the turf season, and is run over one mile at Doncaster. The race is for horses aged four years and older and has a purse of approximately GBP 100,000. Check out the race’s wiki page for further information on the race, and read our in-depth preview of the race here.